By Melissa SouzaEverywhere I go around the homestead I have four little ones following close behind me, two of which always have their boots on the wrong feet. Folks are always asking how we get it all done with four homeschooled children. It is true that I never have a stretch of time when children are gone at school, but that only means that I have helpers all of the time. Homesteading with children is a state of mind. If you try to distract them so you can get your work done it will be a constant battle of rushing and leaving tasks unfinished. We started this homesteading journey for our children. We wanted them to see the great value in living a simple life. It is important that our children know things, and by things I don’t mean electronics. I mean real things like how to process meat, plant a garden, save seeds, and care for the land that takes care of them. As a busy parent that needs to get many things done every day, it is tempting to tell the kids to go play, but we are learning the value in taking the extra time to include each of our children in the daily chores. Each child has a set of jobs that are only their responsibility. We speak to them about how vital that role is, and why it is so important to take that responsibility seriously. 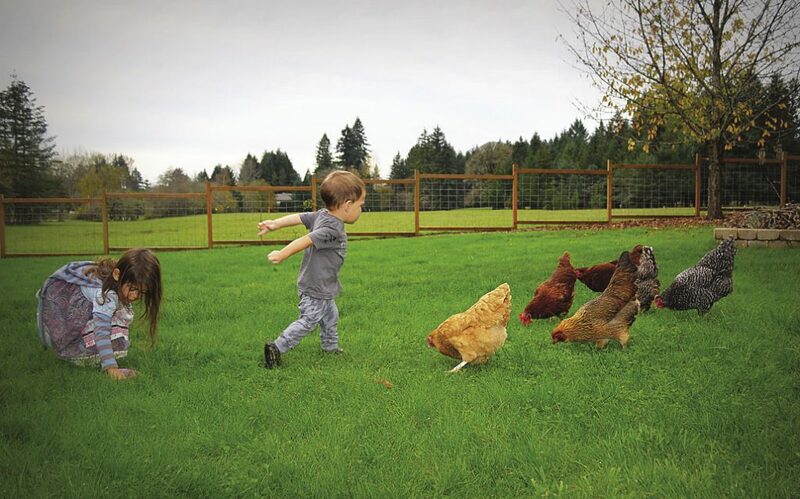 My seven year old son is in charge of feeding the chickens, dog, cats, and rabbits. We explained that they eat before he does, because they depend on him. He never forgets to feed any of them, because he sees that they wait anxiously for him every morning. 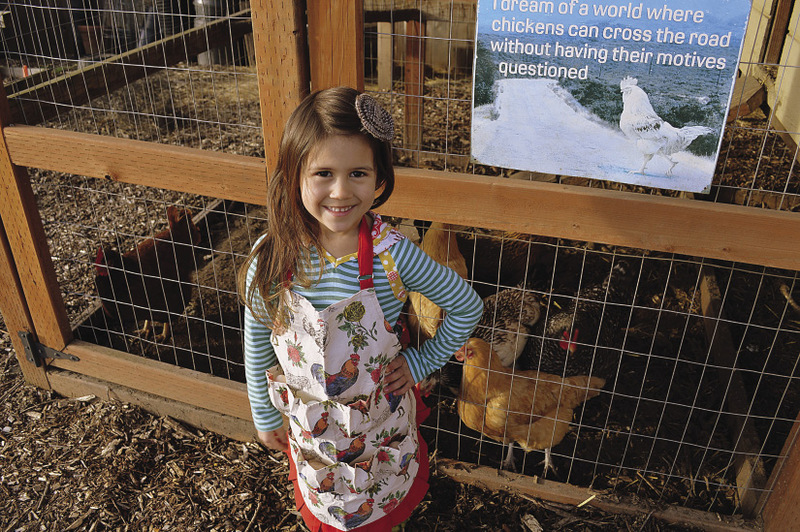 My four year old daughter gathers eggs after breakfast, and she has a special egg collecting apron that is just for her. This makes her feel important, because she is literally bringing breakfast in for our entire family. 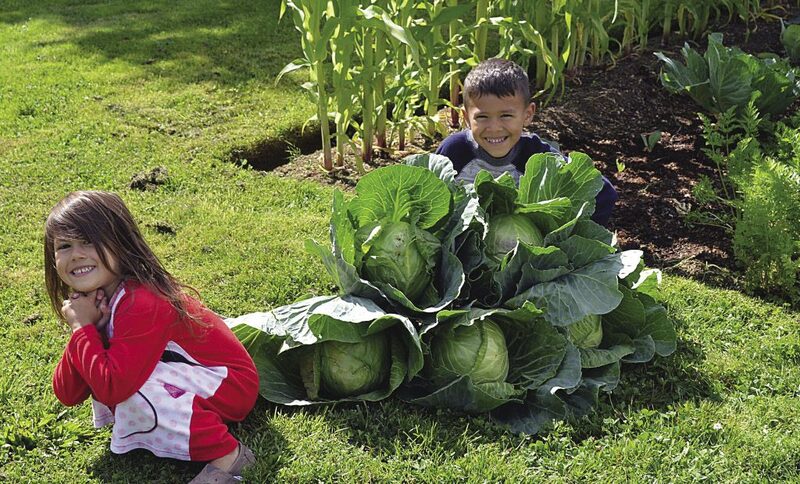 My husband and I teach our children to harvest and clean ripe produce from the garden to provide food for our family and our small CSA. 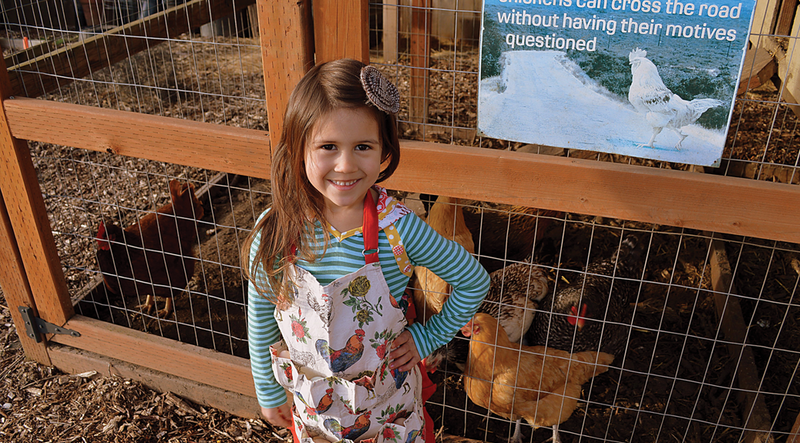 Our daughter and her special egg-gathering apron, which she uses to gather eggs every day. When it’s time to gather firewood, my husband always makes sure to bring our oldest boy along so he can learn how to safely chop wood, and how to stack it so that it dries properly. They have built a firewood shed, rabbit hutches, nesting boxes, a storage shed, and a child-friendly chicken coop together. It would be much quicker for my husband to do these projects on his own, but each new project is an opportunity to teach our children measurements, angles, types of wood, different tools, and hard work. 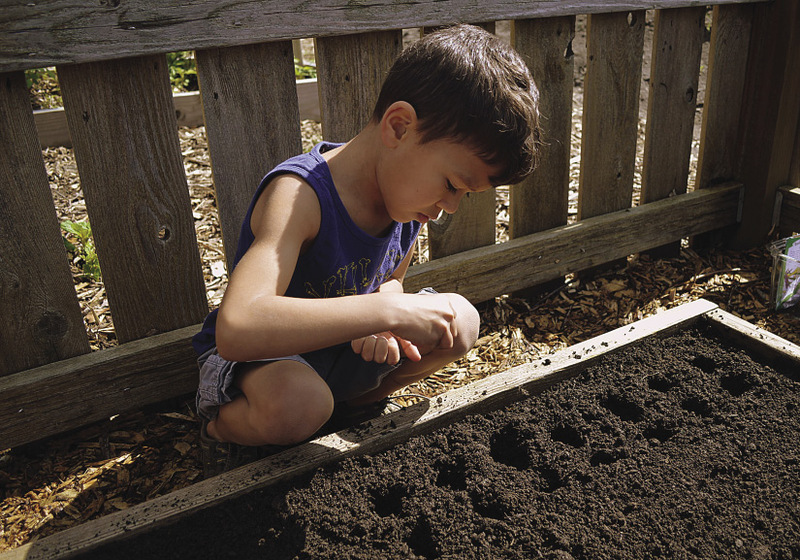 Planting seeds may take longer with little kids, but the joy they gain from growing food for their family can’t be duplicated any other way. The chicken coop was designed specifically so that our children could manage the hens without our assistance. 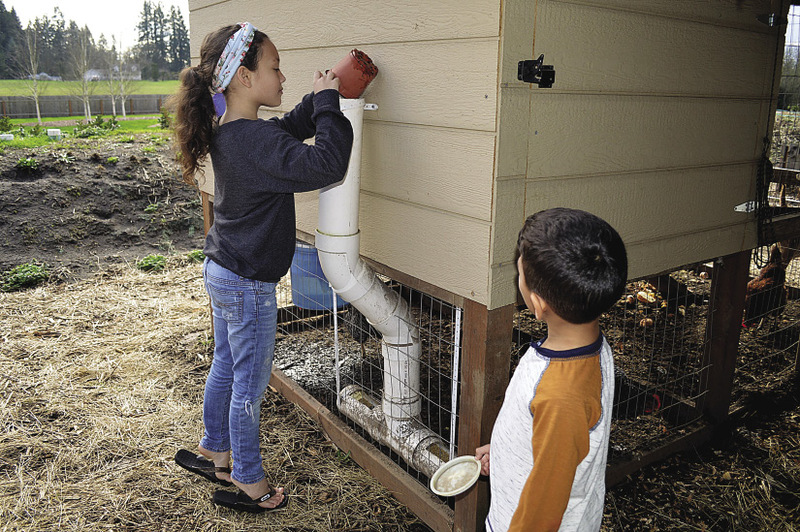 The food and water delivery systems are designed so that they never have to enter the coop. Eggs are collected from outside, and the back is easy to open so that they can clean out the coop themselves. Our rabbit hutches are similarly designed, and the animals that feed our family have become the responsibility of the kids. This gives them ownership and respect for those animals when it comes to processing day. They have not gotten into processing the animals for meat yet, but that will come with time. They do watch and ask questions, and we explain the anatomy and steps involved in butchering. We save hides, and they help me tan and stretch the leather. They have learned that we use every part of the animal, and that is how to respect their sacrifice. 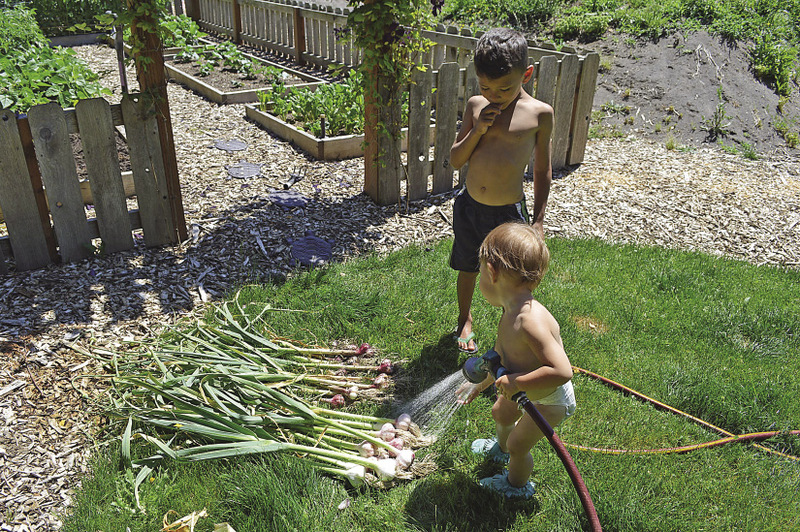 Learning to preserve the harvest is another wonderful skill my kids learn on the homestead. We often turn extra cabbage into kimchi. Our favorite time of the year is when we start planning our garden. They get to select special vegetables that they would like to grow that year, and experience success of planting the seeds they helped save from the season before. When we are preparing our garden compost, we talk with them about how our food breaks down and why compost is important to feed our gardens. The kids all get out there every spring with rakes and shovels to help prepare the gardens that will feed them year around. 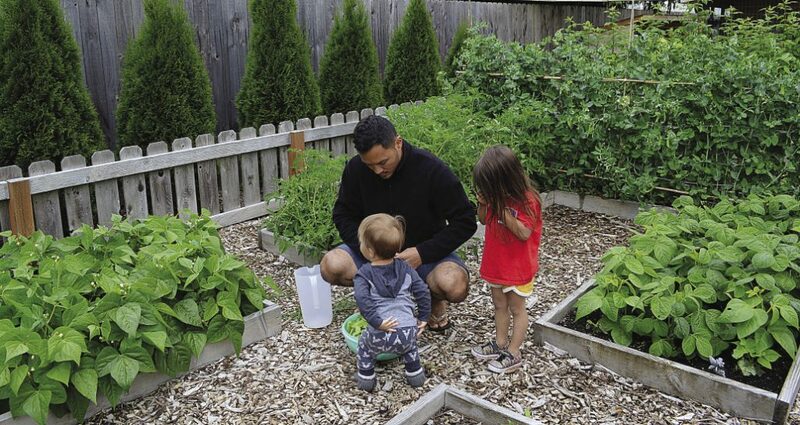 All four kids help plant seeds, weed, and water through the spring. You could walk around the entire property with our four year old, and she could tell you what each seedling is. I love watching her explain to visitors that the frilly ones are carrots, and the big round leaves are cucumbers, and the tall vines are sweet peas. It takes us longer to get our garden in the ground with so many tiny fingers poking around, but it makes every extra hour worth it when we see how proud they are of the carrots that they grow. 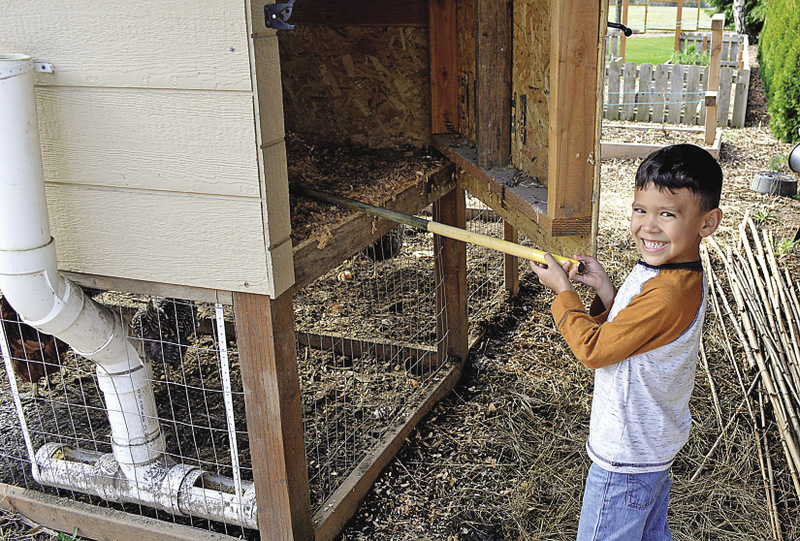 We built our coop to make sure our kids could manage the care and feeding of the hens all by themselves. The feed and water is added from the outside, and the entire back of the coop opens to make it easy to rake out the spoiled bedding into a wheelbarrow. Summer months bring daily garden collections, and they are so excited to bring in large baskets of greens, and even more eager to eat them. We run a small CSA, and when people come to collect their baskets, all four kids take such pride in everything that goes into them. Summertime also brings abundance that we preserve for the fall and winter months. Including the children in the canning process has been one of our best homeschool learning experiences. They learn to read recipes, measure exactly, and tell temperature. We have learned about bacteria, acids, and kitchen safety together, and that is a real world skill that will stay with them. 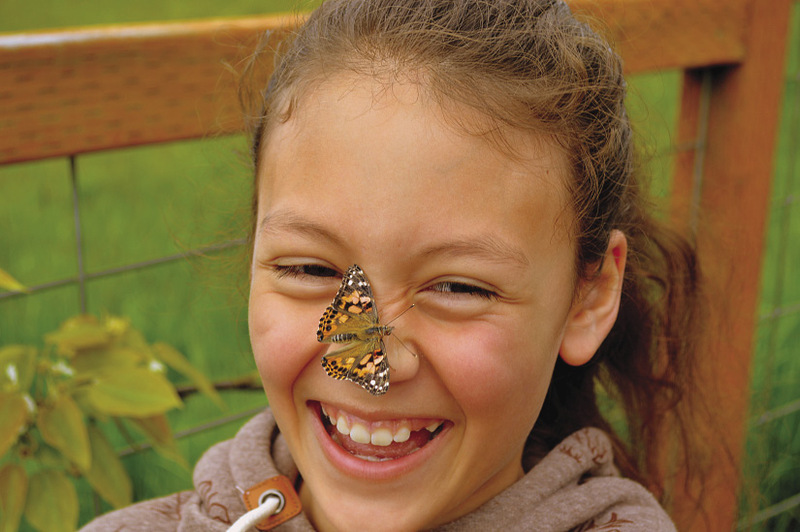 Homesteading with small children is very possible, and in many regards what keeps us going. We live this life for them, so why would we not teach them every aspect of how to live this life in the future? My grandma tells me that this season in life is long days, and short years. I remind myself of that when I am watching my two year old stirring most of the flour out of the bread bowl. At the end of the day our children have dirty feet, and smell like sunshine, and we can almost bet that they have learned something new. Melissa lives with her husband and children on a suburban homestead in the Pacific northwest. In addition to a garden and eggs, they produce meat chickens and rabbits.